The CoverMate III lift has a gas shock mechanism which makes opening covers effortless. The large aluminum mounting brackets, tubing and full bar construction provide superior strength. The break-proof locking system stabilizes the cover and eliminates broken shock problems. 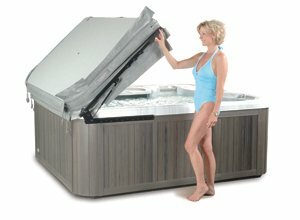 Ideal for spa housed in gazebos or when space behind the spa is limited (minimum 6" clearance behind spa).